Advertise on healthy living blog, Sensual Appeal with a discount code! New design and direction of Sensual Appeal + Discount code for sponsors! Hello dears, I want to wish you all a marvelous Monday! What I wanted to bring to you attention is my new blog design! You might have already noticed it because I’ve had it up for 1-2 weeks now but you never know. I wanted to spend a little bit of time to do an official introduction of the brand new Sensual Appeal blog! I want to say a big THANK YOU to Natasha from My Cute Lobster for designing the blog and being so helpful and accommodating throughout our interaction. I can’t recommend her enough! With the new blog design comes new blog direction. If you have been following me for a while, you might have noticed that I talked a lot about dieting fads, weight loss, and such in the past. Well, I want to say that you will no longer see any diet or weight loss talk on this blog anymore. After picking up intuitive eating (see post: “I am giving up”) I have changed my whole perception on life. There is more to life than dieting. What’s the point in striving to be skinny all the time if I’m only going to be miserable in the process? It’s more important to FIX the relationship with food: stop hating and guilt-tripping ourselves for eating a dessert; stop feeling sorry for ourselves for not working out a certain day when we should have done so. Life is more than obsessing over calories, fats, and carbs. Life is about LIVING it and being HAPPY with who we are, no matter what. Intuitive eating gives us the ability to enjoy food without feeling bad about it. We listen to our body and honor what it wants or craves. We might not become fitness models, but at least we can be realistic with what we want from life and allow our body to come to the natural weight it should be at while enjoying all of the little things life has to offer – such as delicious food. And yes, that includes desserts. This is NOT to say that I have abandoned healthy eating practices. Absolutely not. I love nutrition and I think it’s important. It’s important to eat your vegetables (something I am still working on) and getting ample amounts of protein. This is for nutritional reasons so we can feel the best we can. These practices are NOT done with weight loss in mind, their purpose is to make us feel good and so we can be able to function on the highest level. This also means that it is important to exercise but do so the way YOU like to do it. There is no point in punishing yourself with excruciating exercises and workout fads if you hate them. There is an infinite number of workouts and fitness classes and styles to fit anyone’s needs. Life is about enjoyment, pleasure, feeling good, and being happy. Being active is an important part of accomplishing these simple goals. To end the rambles, I want to introduce something totally new to Sensual Appeal blog! I am now accepting SPONSORS! 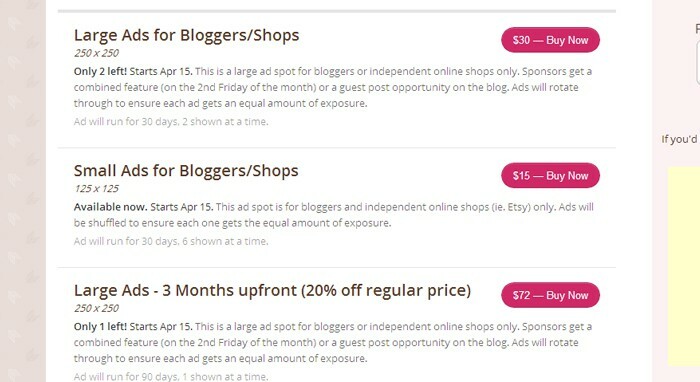 If you are a blogger or a small online shop owner and you would like to advertise on my blog, I want YOU to check out my Sponsor page for more details. New sponsor ads will be featured on the sidebar under the “Sponsor” tab. There are none there right now since I just launched this feature. Since this is my first time launching sponsorship opportunities, I am offering you guys a DISCOUNT CODE! If you enter the code “NEWDESIGN” you will get $5 off the price! 🙂 This code will only be available for the first few weeks of the launch and will become inactive in May. So take advantage of this opportunity right now! It’s only a few dollars! And that’s marvelous so I’m linking up with Katie’s MIMM party 🙂 Go wish her a happy birthday! Completely love the new design. And that the word happy got capitalized in your new description! 🙂 Can’t wait to see where you take this. It’s going to be awesome! The new blog design didn’t register for me until you pointed it out. Love it! I need to do some reading up on intuitive eating. Yay! First of all, I love the change in your attitude, gorgeous girl! I’ve always been into health (in the balanced sense of the word, not the just-carrot-sticks-and-5ks sense) on my blog, but I’m thinking about doing more bloggy posts (a slight change, again, from the review-based direction I was going in). Your blog has gone so far so fast and I’m just so impressed! And I LOOOVE the new professional (but fun) look! Love the new design and direction of your site!! love love love the new design Kammi! I am totally with you about the “diet” thing, it’s about a healthy lifestyle not about being a certain size. I am looking forward to following your new posts! The new site looks gorgeous and I love your new attitude towards food to go with it! I used to be pretty eating disordered and now that I have intuitive eating in my life, there’s no need for it. It’s much more important to be happy! I love the idea of new blog direction! Ahhh, I love how you described how life SHOULD be!! It really is all about LIVING…about being happy AND healthy…in a way that honors and respects our bodies and minds! I am SO happy that we’ve both decided to free ourselves from the prison of the dieting mentality! I swear, I’ve never felt happier!